Cephalopod in a hard shell. The shell is white with red to brown (zebra) striping. It has up to 90 tentacles surrounding the mouth, lacking suckers. The contains several chambers on the inside. A central tube, called a siphuncle, is connected to each of the chambers, releasing or extracting gas to control buoyancy and stay upright. White to brown, flexible flap just above the tentacles, which can be used to close off for protection of the delicate parts. Nocturnal species. Unassessed by the IUCN Red list. Very uncommon species of cephalopod because they normally stay well below depths of 100 meters. They only move to shallower water for feeding, normally at night. They can be found in the Indo-Pacific, from the Andaman islands to the Philippines, from Japan to Australia and Fiji. Occurs on the continental shelves and slopes. They prefer hard bottoms, particularly coral reefs, in a depth range of 0-750 meters, normally between 60 and 240 meters. 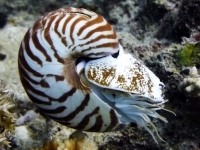 Nautiluses start to reproduce at an age of 15-20 years. Males perform displays to attract females for mating. The males uses 4 tentacles to transfer a spermatophore to the mantle of the female. When the protective coating breaks down, the sperm is released. Females hatch the embryos that remain into a planktonic stage for some time before they settle to the bottom to grown further. Adults usually die shortly after mating. Shell diameter up to 20cm. They feed on crabs and fish, which they catch by sense of smell since their eyesight is poor. Science had recognized 6 species of nautilus in 2 genera, but recent genetic research suggests there are only 3 species in 2 genera, N. pompilius with N. belauensis and N. stenomphalus as subspecies, N. macromphalus and Allonautilus scrobiculatus. 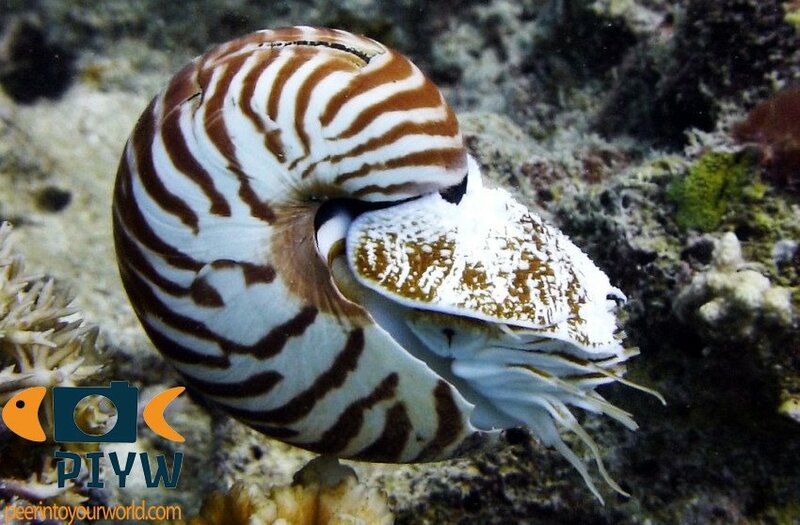 Nautiluses are referred to as living fossils because they have been around – practically unchanged – for a very long time. N. pompilius has been traced back to the Triassic period, over 200 million years ago.